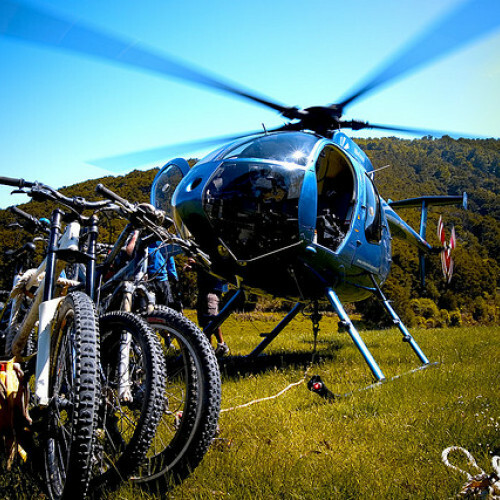 Why Heli Biking Under Mt Everest? Forget the weekend ride-out; we’re talking helicopters, the Himalayas and one hell of a bucket-list downhill that will have you vibrating with adrenaline for days. You arrive in bustling Kathmandu and fly by helicopter across the Roof Of The World to reach phase one in Throng-La. The guys here don’t understand the term ‘practice run’ so your white-knuckle descent starts the moment you leave that chopper! 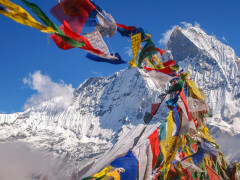 A Journey Into Nepalese Mountain Culture. The Nepalese people love their tea sweet and often so you’ll break up the ride with pit stops at traditional teahouses. Later, after a well-earned feast of Dal Bhat, you’ll bed down in a humble mountain lodge in the village of Muktinath. Rested and full of caffeine you will follow the Kali-Gandaki River down steep valleys, through quaint villages, terraced paddy fields, dense forests and over precarious suspension bridges. Keep the Go-Pro rolling as you pass under three mighty snow-capped mountain ranges: Mt. Annapurna, Mt. Dhaulagiri and Mt. Manaslu. They have to be seen, recorded and re-watched a dozen times to be believed! As the adrenaline reserves finally empty, ease those aching muscles in hot springs at Tatopani and try not to think about that comparatively ordinary weekend ride-out! Helicopter across the Himalayas to reach the downhill starting point. The diverse landscape, from quaint villages to snow-capped mountains. Meet the people who call the Himalayas home.